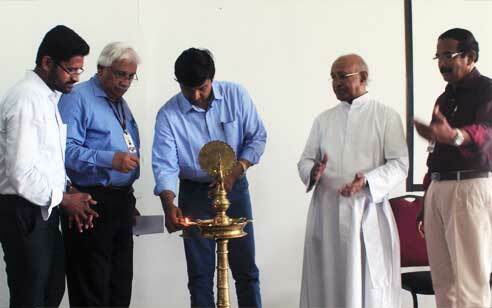 Startup Café was inaugurated by Dr Jayasankar Prasad C, CEO of KSUM. “We are looking forward for the Institutions to have more such initiatives in the campus. Many premium institutions in the world promotes start-ups in big way. There are many companies in which the members of faculty will be on board of Directors, which will enable young and budding student entrepreneurs to leverage his skills and talents for their ventures. Alumni members taking active roles in start-ups will add the pace of such initiatives. He also touched upon the fact that there are a lot of areas in which need significant innovations. As our country being at its development stage there are en number of problems to be addressed, start- ups has huge opportunities to grab. Students and their project guides should focus more on solving problems differently, that could potentially be converted to a product or service. He also pointed out that Incubation Centres should promote more intellectual property filings and Kerala Start-up Mission has the policy of reimbursing the complete patent expense for the start-up ventures.” Said Dr Jayasankar. “Entrepreneurship is the next big boom that will add more value to the society. The institution is looking forward to enhance the entrepreneurship culture among RSET members. We offer full support for our students and alumni members to become successful entrepreneurs and create more jobs. We want more of them to evolve from job seekers to job providers and support the society and nation” Said Fr. Jose Alex Oruthayappilly CMI, Director of RSET. “The Intellectual Property Consulting Centre set up at campus by RSET Alumni has already filed two patents using the RSET Alumni Patent Filing Advancing funding scheme. RSET Alumni will be more than happy to advance funds for Patent Filings for those who genuinely need financial support. The Intellectual Property Consulting Centre is offering free guidance and support for all IP filing aspirants including those from public. . RSET Alumni Association, which has more than 4000 members worked in core industry in cutting edge technology will join hands with the Start-ups at the RSET Incubation Centre and Entrepreneurship Cell. ” Said Rijin John, President-RSET Alumni Association. Principal Dr A Unnikrishnan, Dean & Vice Principal Dr John M George, RSET Alumni former President Mr Vivek George etc. spoke over the function.